Plato was a great philosopher. Locke was a great psychologist. Norman Borlaug was possibly the world’s greatest agricultural visionary. Born in Cresco, Iowa, Borlaug grew up working on his family’s farm until going to the University of Minnesota’s General College. Studying plant pathology and genetics, he eventually took up a research position in Mexico developing new wheat varieties that would feed people in Mexico, Pakistan and India. Known as the Green Revolution, this period during the 1960s signified an era of increased food security. Borlaug is accredited for ensuring the food security of 1 billion people, receiving the Nobel Peace Prize, the Presidential Medal of Freedom and the Congressional Gold Medal for his noble achievements. Frustrated with not being able to create a Nobel Peace Prize for agriculture, Borlaug continued to found the World Food Prize in 1986 to distinguish individuals particularly influential in improving the lives of people through developing the quality, quantity or availability of food. The World Food Prize, based in Des Moines, hosts a week long conference every year to honor these special individuals and promote awareness of food insecurity across the globe. It invites current and ex-presidents, CEOs and other leaders in food development to participate. On Oct. 13, Brazil and Ghana’s former presidents Lula da Silva and John Kufuor received the World Food Prize for their outstanding accomplishments. A growing branch of the World Food Prize is its Global Youth Institute. Occurring during the last three days of the annual World Food Prize, it allows high school students to learn more about food development and meet inspirational leaders in the field. Students from any high school in the United States may apply for the Global Youth Institute. I was fortunate enough to be one of these students. On Oct. 13-15, I experienced with more than 100 others an absolutely stunning three days that transformed my perspective on the hunger crisis in the world. Previously, I knew that hunger is a growing issue. But something I would not have known otherwise is the feeling of genuine concern for the wellbeing of a person living on an entirely different continent, whom I do not know and can only perceive. The level of focused energy at the Global Youth Institute changed my appreciation for the world. But make no mistake; the Institute is no simple vacation from high school. Participants can expect a very busy three days listening to speeches and visiting food development organizations. Because the World Food Prize does its best to incorporate the Institute into its own week long events, participants also have the opportunity to spend meals with the high-end dignitaries most people only hear about on the news. On the Institute’s first day, I found myself eating lunch with a man who grew up in Goma, an unstable city in eastern Democratic Republic of Congo, and now works in Kenya with the African Insect Science for Food and Health. 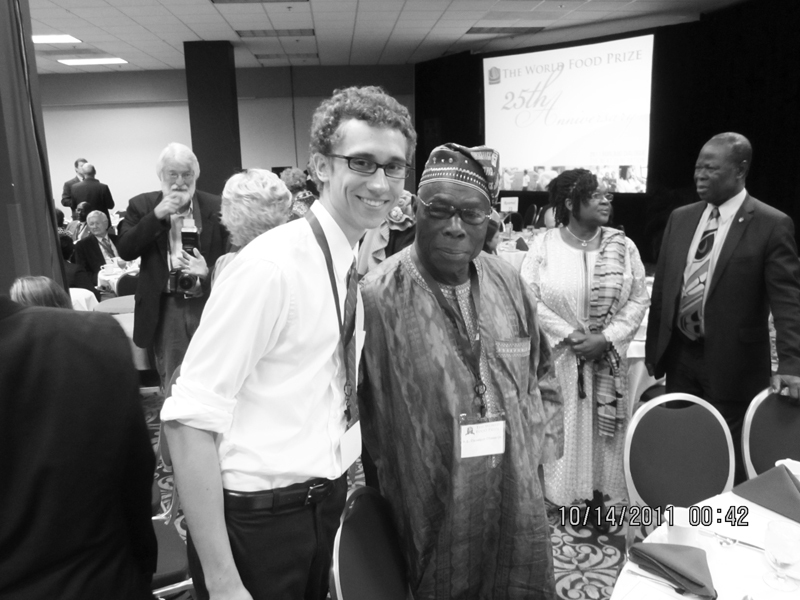 Later, I introduced myself and spoke with Olusegun Obasanjo, former president of Nigeria. Meeting people like these seems to me the most important element of the Institute, as it allows participants to meet world leaders at eye level without the paranoia of being scrutinized by security guards. What’s more, these leaders want to meet Global Youth Institute participants. It is the youth that must carry the world into a future with hunger. To attend the Global Youth Institute, students must first register and write a research paper examining one factor affecting a choice country’s ability to produce food for its people. My research paper discussed increasing the effectiveness of humanitarian relief and food aid in the Democratic Republic of Congo (my lunch mate from the Congo and I had plenty to talk about). As writing this paper is quite an extensive process, the Institute encourages students to begin writing in the summer so as not to panic when the school year intervenes with free time. The Institute culminates with a presentation of the participant’s findings on its last day in front of a panel of experts. Mrs. Debbie Paulsen, high school biology teacher, is the high school’s representative to the Global Youth Institute. She selects one sophomore or junior every year to apply for the Institute based on the student’s interest. Selections are made near the end of the school year. The Global Youth Institute—and the World Food Prize, for that matter—don’t receive as much publicity in the high school setting as they deserve. The Institute is an opportunity to explore interests that may change a student’s focus in high school and beyond. 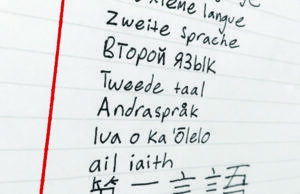 “It brings together so many aspects of high school curriculum. And it is real… It is not just high schoolers and simulation of real life… It is the actual policy makers, scientists and global stakeholders… And they want to talk to you!” said Paulsen. Sophomores, juniors, high school students all: The Global Youth Institute will stimulate your minds. It will strengthen your interests in the world. It will teach you about a topic you may not have had a passion for before. Place yourself in a culture of individuals who share a common interest for food security and embrace it. “It is just two hours away, it salutes Iowa’s Nobel Prize winner, it is a great experience,” said Paulsen. At this point, I should mention that you should not apply for the Institute if your goal is to pad your resume. Interests must be genuine, because the experiences waiting there require complete honesty to be worthwhile. Any student who attends the Global Youth Institute is eligible to apply for an all expenses paid summer internship known as the Borlaug-Ruan International Internship. It allows students to spend two months conducting scientific or social research in a country experiencing food insecurity. Past interns call it a life-changing experience. Without Norman Borlaug’s influence, the Global Youth Institute would not exist, the World Food Prize would not exist, the Green Revolution would probably never have existed. He was an idealist, a person who fought impossibility for his goal of a world without hunger. His extraordinary life ended on Sept. 12, 2009. To learn more about the Global Youth Institute or the World Food Prize, visit the World Food Prize’s website. ← Previous Story The Cain Campaign: Questionable advertising or complete genius?